James Milner at left back. Simon Mignolet STILL in goal. Jordan Henderson being primed as a defensive midfielder of purpose. Adam Lallana Appreciation Day coming soon, for a man who seems set to follow in the footsteps of Joe Allen in becoming the ‘darling’ of the crowd, when previously viewed with cockeyed suspicion. Re-cycled furniture, the lot of them. Re-cycled furniture can be great. Re-cycled furniture can also be a waste of precious space. Take away that one hideous error and Lucas didn’t do much else wrong. He’s not a centre back though. Lucas will never be a centre back. You know what? I always thought that Steven Gerrard could have prolonged his Liverpool career by dropping into centre back. It was at least something I felt should have been experimented with. Now that would have been re-cycling. We’ve heard a lot of late about that new Main Stand. Parts of the new Main Stand are re-cycled. Some of the lower tier is made up of the structure which was still in use last season. Some parts of it are remnants of the old Archibald Leitch Main Stand which made way for the one we demolished in the summer. Comforting elements of the old within something of the new. I’m part of that new, but I often feel like I come from the old. My season ticket is in the Upper tier of the new Main Stand. 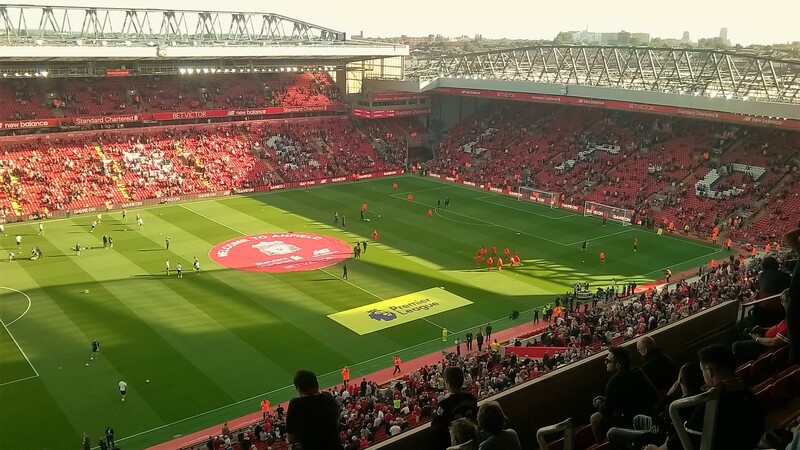 The new Main Stand has been all over Liverpool FC and social related media in the last few months. I’d suffered new Main Stand fatigue long before tipping up for the first home game of the season. My cousin Neil even worked on the new Main Stand. I ignored the new Main Stand when I arrived at Anfield and stuck to my usual pre-match routine of congregating for idle chatter at flagpole corner instead. I wasn’t being militant about it, but if you overkill me with a subject-matter in an overly enthusiastic manner then I’m going to put my fingers in my ears and close my eyes. La, La, La, La, La, La, La, I ‘am not listening. I eventually yielded and went in. There was a new seat to find after-all. There was also my 78-year-old dad to consider. He needs to know what’s what and where things are. We sit together. He’s simultaneously hard work and a joy. I love him to bits, but he drives me to murderous thoughts occasionally. You’ve never known inner rage until you’ve been on the receiving end of my dad’s backseat driving in downtown Geneva. He’s seen more than I ever will though. He was in that old Archibald Leitch Main Stand almost 47 years ago when we beat Leicester City 4-0, with all four goals scored within the opening 12 minutes. He was with ‘Our Neil’s ‘dad, my uncle Dave that day. They stumbled into the ground with over 15 minutes already played. They didn’t think to ask anyone if they’d missed anything important. They saw no goals. They saw Bill Shankly’s Liverpool saunter around the lush green pitch without a care, or even an urgent bone in their body. They walked from the ground after the final whistle, shoulders slumped, cursing an inept Liverpool while other people raved about an incredible game. It was only when they got back to the car and switched on Sports Report when they heard Liverpool had won 4-0. It has to be said, that having avoided it for as long as possible, it is one hell of a new Main Stand. I get to see the two cathedrals from my seat, while sat in my own cathedral. From the concourse you can see the river. You can also see Goodison Park. I used to have a seat in the Upper Kemlyn, before I switched to the dear-departed Paddock. I’m used to the elevated view. It’s why I jumped at the chance of a seat in the new upper tier when relocation came knocking. You get to see everything from an elevated position. The movement, the shapes, the patterns. If you get the opportunity, then go up and have a look. You see the game like nowhere else. Yes, you’re detached somewhat from the general feel of being at a football match, but you miss nothing. I didn’t miss Dave Webber. Dave Webber is a Twitter comrade. I’d never met Dave Webber before, but we’ve nodded and laughed at the same things long enough on Twitter to make it feel like I’d met him before. He was sat just two rows behind me and now we’ve actually met. That was nice. I did miss the old faces I used to share the Paddock with though. Familiar faces of people I knew very little about, some of whom I didn’t even know the name of. I was surrounded by new faces. New sounds. That fella two or three rows up and diagonally to the right needs to go. He’s a stereotypical Henderson-hater. Jordan Henderson is apparently a tart. I loved the way those words lodged in his throat as Henderson threaded through a millimetre perfect through-ball to Sadio Mane at one point of the game. Social justice at its finest. I’m really starting to buzz about the way we go forward. Mane is belligerent. If he keeps this up he’s going to be monstrous. Roberto Firmino continues to blossom. He has that wonderfully rare ability to be able to take the ball right up to a defenders face at speed, then completely change direction without breaking velocity. Some doubt him, but don’t be one of them. Firmino can become a better footballer than the universally spectacular Philippe Coutinho. Fine goal. Needs to work on that beard though. It’s neither here, nor there. Daniel Sturridge will get a couple of goals in a game like this on another occasion. Chelsea on Friday it is. Immediate thought was that they’ll be tired after a mid-week Champions League game. “Oh yeah” thought I. They were worse than we were last season weren’t they? Klopp-Conte-Guardiola-Mourinho-Wenger-Ranieri-Pochettino. It reads like the cast list of a mid-1980s middleweight boxing dynasty.